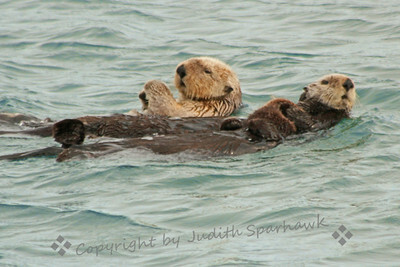 Sea Otters wintering in the harbor area of Morro Bay, California. Quite a few of them had babies, as did this one. 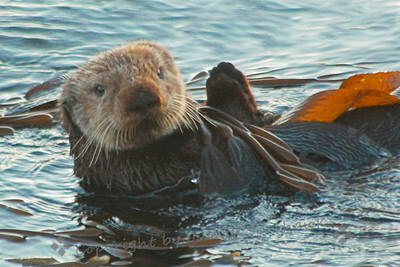 This sea otter was bathed in early morning light in the harbor at Morro Bay, CA. 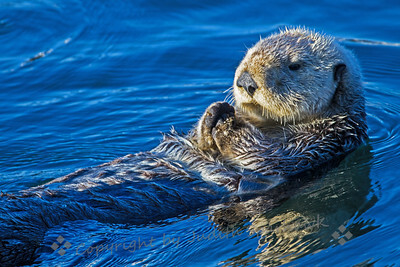 This sea otter was photographed in the harbor area of Morro Bay, CA. 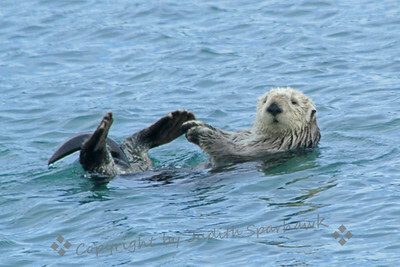 Sea Otter, Morro Bay, CA. 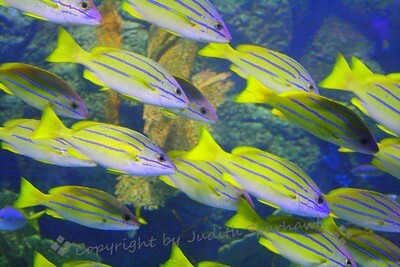 These pretty fish were swimming as a school, flashing their colors as they changed directions. Aquarium of the Pacific, Long Beach, CA. 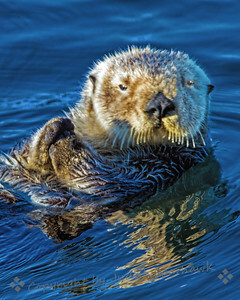 Here's Looking at You ~ This otter paused in rubbing his paws together, to look right at me as I snapped photos. Love his fuzzy face. 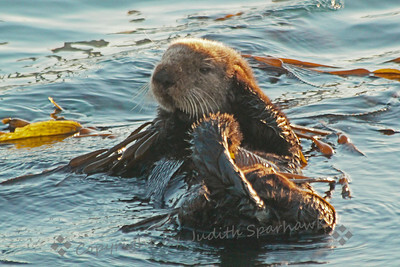 Sea Otter in the Kelp ~ The sea otters in the Morro Bay area come in closer to shore in sheltered areas in the winter. The sun is just coming up, lighting up the fur on this cutie. 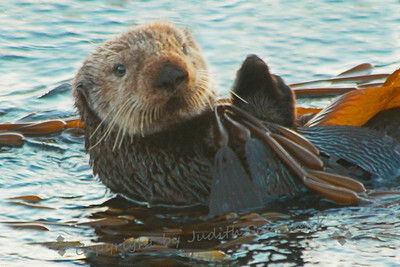 Sea Otter in Morro Bay ~ This cute otter was rubbing his "hands" together, maybe to warm them up. I understood the feeling...my hands on my camera were freezing in the pre-dawn chill in January. 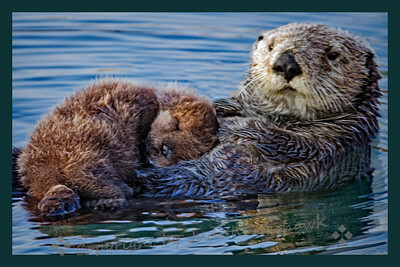 Momma & Child ~ Two of the sea otters I saw in Morro Bay were holding babies. This one shows the older of the two young, after Momma lifted him off her chest and he swam around her, until she again hugged him to her. 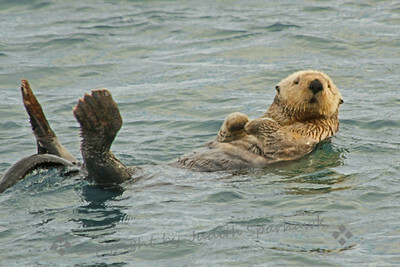 Sea Otter ~ I was excited to find 12 sea otters swimming, loafing, playing, in the sheltered lagoon by The Rock at Morro Bay this week. I had never been there in the winter, and I'm not sure if this is a common occurance or just a lucky break. I spent quite awhile taking photos, and trying to capture their sense of play. 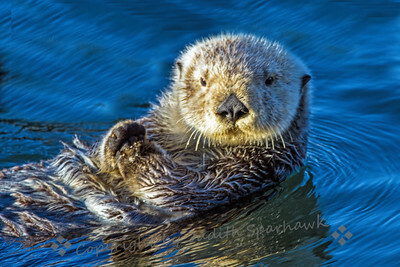 Fuzzy Face ~ This was one of the sea otters I photographed in Morro Bay this week. 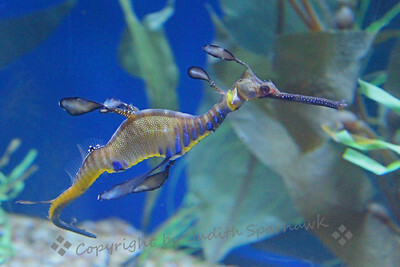 Weedy Dragon ~ Another strange and wonderful sea creature from the aquarium. 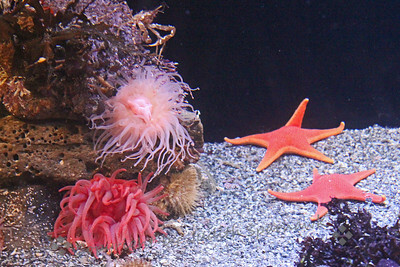 The Aquarium of the Pacific in Long Beach, California is really a fun place to visit and stretch the imagination regarding what strange sea animals and fish are possible. 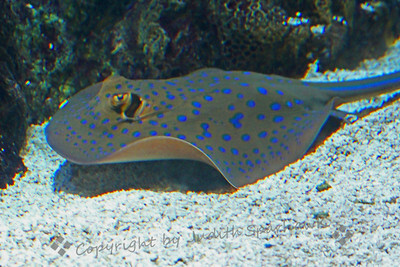 ~ I didn't catch the official name of this ray, but he had brilliant blue spots on his back and a stripe down his tail. I loved the graceful sweep of his body as he swam along the sandy bottom. Aquarium of the Pacific, Long Beach, CA. 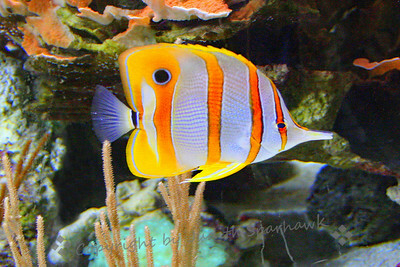 ~ This tropical beauty was just one of many colorful fish in the tropical preview tank at the aquarium--designed, I think, to lure us into the rest of the exhibit. Guess it worked! 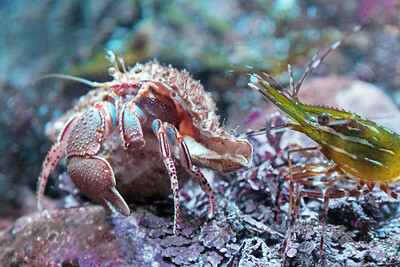 ~ I liked the texture and colors on this Hermit Crab, and what appeared to be interaction between the crab and the shrimp. ~ Although shooting at the aquarium presents exposure and focusing problems, I managed to come back with a few nice images. 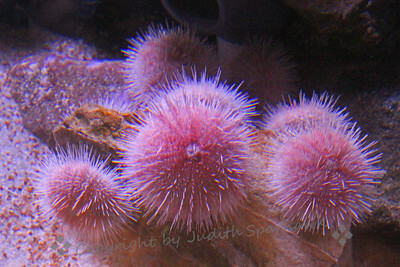 I like the color and how soft these urchins looked. I especially enjoyed the tropical section of the aquarium, with all the beautiful colors. 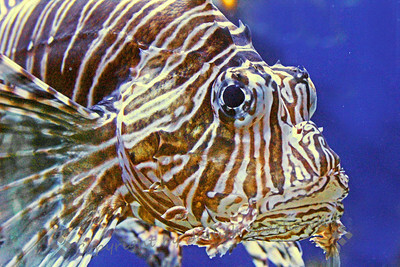 Lion Fish Portrait ~ A face only a mother could love. The lion fish is really a beautiful fish with interesting fins and tail. This portrait doesn't do him justice. 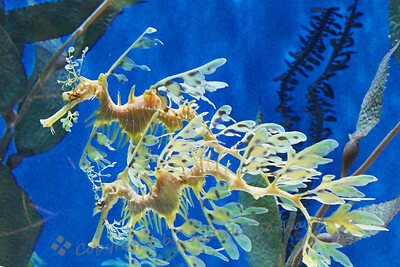 ~ These strange and wonderful creatures are called Leafy Dragons. I managed to capture two of them swimming in tandem. The aquarium certainly offers a feast for the eyes. It is hard to imagine that some of these sea creatures are actually real. ~ Although shooting at the aquarium presents exposure and focusing problems, I managed to come back with a few nice images. I like the colors and streamers on these anemones. I especially enjoyed the tropical section of the aquarium, with all the beautiful colors. 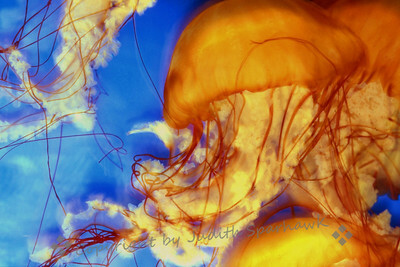 These jellies were photographed at Aquarium of the Pacific in Long Beach, CA. I believe this was a film shot, many years old, which was digitized after I stopped using film. 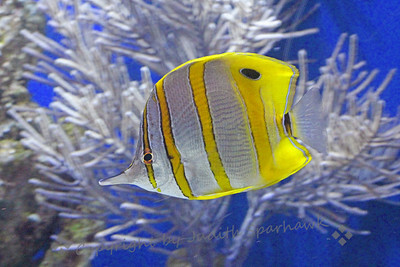 This beautiful tropical fish was photographed at Aquarium of the Pacific, Long Beach, CA. 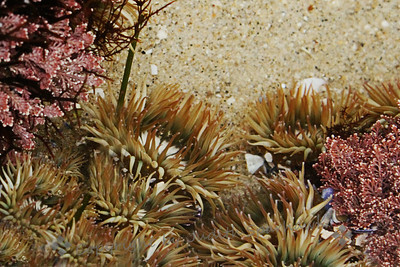 ~ This was a whole cluster of smaller anemones in the corner of a tidepool. I liked their colors against the pink seaweed. ~ It is a lovely thing to peer into a tidepool, wondering what you will find, what treasures it will hold. This was one of those moments. 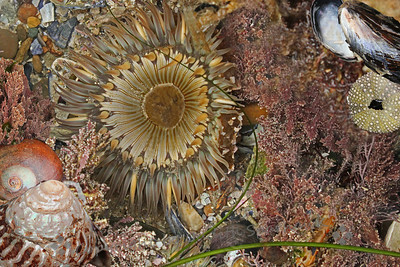 ~ This is one of the shots from a tidepool trip to Laguna Beach, California. 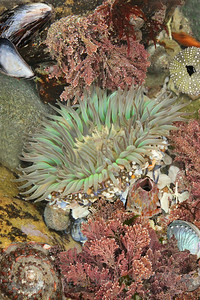 The anemones were varied, some green, some almost pale white; this one had an interesting mix of patterns and colors.